The collection of European art at the Gallery comprises paintings, sculpture, textiles, and decorative arts from the 9th through the 19th century, including one of the world’s finest groups of early Italian Renaissance paintings, as well as notable works by such Northern masters as Hans Holbein, Frans Hals, and Peter Paul Rubens. Encompassing close to 2,000 objects, the Yale University Art Gallery’s collection of European art comprises paintings, sculpture, textiles, and a small but distinguished group of decorative arts, spanning the 9th through the 19th centuries. The painting collection is panoramic in range, with particular strength in Italian art of the early Renaissance. Featuring one of the largest and finest groups of 13th- and 14th-century Tuscan paintings in the world, it also contains a significant number of 15th-century Sienese paintings and such acknowledged masterworks as Gentile da Fabriano’s Virgin and Child (ca. 1424–25), Antonio Pollaiuolo’s Hercules and Deianira (ca. 1475–80), and Pontormo’s Madonna del Libro (ca. 1545–46). The early Italian holdings are complemented by Northern Renaissance art, including Hieronymus Bosch’s Allegory of Intemperance (ca. 1495–1500) and Hans Holbein’s Hanseatic Merchant (1538), along with 17th-century Dutch landscapes and portraiture, highlighted by Frans Hals’s De Heer Bodolphe and Mevrouw Bodolphe and a select group of paintings and oil sketches by Peter Paul Rubens and Anthony van Dyck. Nineteenth-century works include important paintings by Eugène Delacroix and Jean-Léon Gérôme, strong groups of paintings by Jean-Baptiste-Camille Corot, Claude Monet, Edgar Degas, Édouard Vuillard, and Paul Cézanne, as well as Édouard Manet’s Young Woman Reclining in Spanish Costume (1862–63) and Vincent van Gogh’s seminal Night Café (1888). A selection of important medieval and Byzantine paintings, sculpture, and functional objects is now on view in the Mimi Gates Study Gallery, on the first floor of the Old Yale Art Gallery building. The new display features artworks in all media ranging in date from the end of the first millennium to the late 16th century, most of which have not been exhibited for 30 years or more. 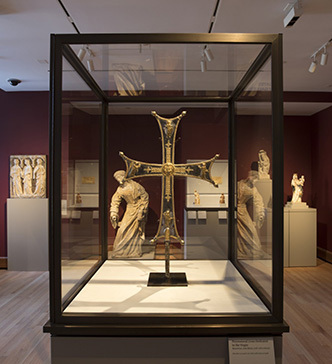 Byzantine-period highlights include a spectacular silver processional cross with gold ornament and niello inlay, possibly from as early as the 10th century, and two icons from the 15th and 16th centuries—one a disassembled, five-panel folding tabernacle—that have only recently been recognized for their authorship and significance. Also on view is Tino di Camaino’s Three Princesses relief, which is among the Gallery’s masterpieces of medieval sculpture, and incorporates Cosmatesque glass inlay in its background; it is juxtaposed with a recently acquired large marble Cosmatesque panel from Rome. Four newly conserved, large-scale, wooden figural sculptures from Flanders, France, and Spain join better-known carvings in marble, limestone, and alabaster, as well as small functional objects in a variety of media. Illuminated manuscripts include a full page from a distinguished, early 14th-century Bolognese antiphonary and one of the museum’s earliest cutout initials, a rare surviving example of 12th-century painting. Laurence Kanter, Chief Curator and the Lionel Goldfrank III Curator of European Art, addresses the early work of Fra Angelico. Laurence Kanter is Chief Curator and the Lionel Goldfrank III Curator of European Art at the Gallery, and he was formerly Curator-in-Charge of the Robert Lehman Collection at the Metropolitan Museum of Art, New York. He received his PH.D. from the Institute of Fine Arts at New York University in 1989. He is the author of the catalogue of Italian paintings in the Museum of Fine Arts, Boston (1994), and coauthor of Luca Signorelli (2001) and of numerous exhibition catalogues, including Painting in Renaissance Siena, 1420–1500 (1988), Italian Renaissance Frames (1990), Painting and Illumination in Early Renaissance Florence, 1300–1450 (1994), Botticelli’s Witness (1997), The Treasury of Saint Francis of Assisi (1999), Fra Angelico (2005), and most recently Italian Paintings from the Richard L. Feigen Collection (2010). He has published widely on specialized problems in 14th-, 15th-, and 16th-century Italian painting and has organized major exhibitions on subjects ranging from Italian maiolica (1989) to monographic shows of the 19th-century English Pre-Raphaelite artist Sir Edward Coley Burne-Jones (1998) and the 20th-century Italian master Giorgio Morandi (2008). Dean, Clay. A Selection of Early Italian Paintings from the Yale University Art Gallery. New Haven: Yale University Art Gallery, 2003. A Description of the Gallery of Fine Arts and the Collections: School of the Fine Arts, Yale University. New Haven: Yale University Press, 1931. Forster-Hahn, Françoise. French and School of Paris Paintings in the Yale University Art Gallery: A Catalogue Raisonné. New Haven: Yale University Press, 1968. Italian Primitives: The Case History of A Collection and Its Conservation, exh. cat. New Haven: Yale University Press, 1972. Kanter, Laurence B., and Carl Brandon Strehlke. Rediscovering Fra Angelico: A Fragmentary History, exh. cat. New Haven: Yale University Art Gallery, 2002. Kenney, Elise K., ed. Handbook of the Collections: Yale University Art Gallery. New Haven: Yale University Art Gallery, 1992. Moore, Lamont. Rediscovered Italian Paintings, exh. cat. New Haven: Yale University Art Gallery, 1952. Neilson, Katharine B. Selected Paintings and Sculpture from the Yale University Art Gallery. New Haven: Yale University Art Gallery, 1972. Offner, Richard. Italian Primitives at Yale University: Comments and Revisions. New Haven: Yale University Press, 1927. Seymour, Charles, Jr. Early Italian Paintings in the Yale University Art Gallery. New Haven: Yale University Press, 1970. Sirén, Osvald. A Descriptive Catalogue of the Pictures in the Jarves Collection Belonging to Yale University. New Haven: Yale University Press, 1916. Sturgis, Russell, Jr. Manual of the Jarves Collection of Early Italian Pictures. New Haven: Yale University Press, 1868.